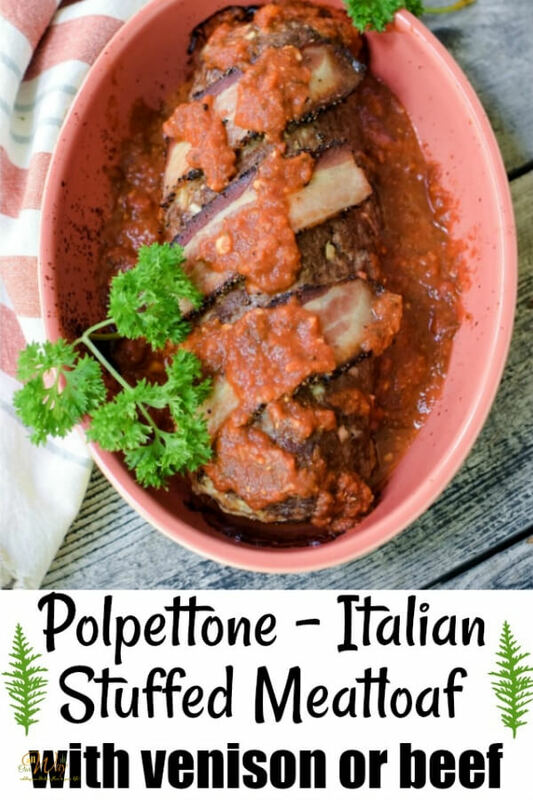 Polpettone is a mouthwatering Italian Stuffed Meatloaf that uses either venison or beef as its main ingredient. But this is not your ordinary meatloaf recipe. Our version uses special ingredients like garlic, parsley, eggs, and Parmesan cheese that lift this popular meat dish from the ordinary to the extraordinary. 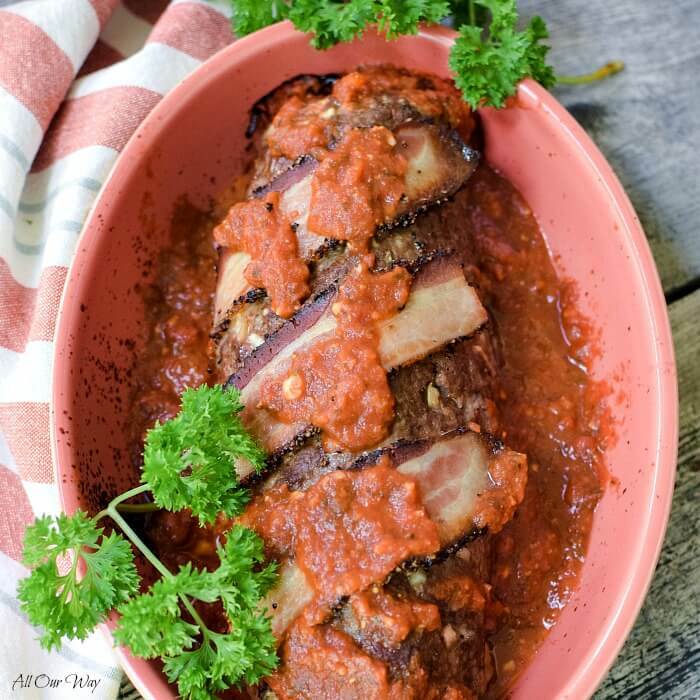 Our Italian venison meatloaf version goes a little further by stuffing the loaf with mozzarella cheese filling that melts smooth and creamy. A comfort food that will become a family favorite. For this recipe you will need 2 pounds of meat (we use a combination of venison and hot Italian pork sausage), garlic, olive oil, onions, eggs, fresh parsley, Italian seasoning, bread crumbs, buttermilk, parmesan cheese, chipotle, mozzarella cheese. The Italian version has no tomato sauce in it. Their version is savory with a mixture of meats and sometimes stuffed with spinach, herbs, cheese, and at times mortadella (a luncheon meat). Sometimes you’ll find lemon zest, cinnamon and a touch of nutmeg in the Polpettone Italian style meatloaf. And instead of soaking the bread in milk, they use red or white wine and even vermouth. The ingredients for our Polpettone Italian stuffed meatloaf is basically the same as garlicky meatballs or spicy venison meatballs. Polpettone or “big meatball” is a classic in Italian cuisine. There are variations of this huge meatball in just about every region of the country. Liguria — made with a mixture of green beans, potatoes, and onions, no meat. Tuscany — ground veal, carrots, and onions. Rome –Lamb, eggs, white wine, and celery. Emilia Romagna — ground beef, pancetta, cinnamon, and nutmeg. Southern Italy — prepared directly in the pan with some onions and diced canned tomatoes. One very non-Italian ingredient we included was a touch of chipotles in adobo sauce. We love the spice and the smoky flavor it gives a dish. Aromatics — onion, garlic, and additional vegetables of choice. Liquids — wine, beer, dry sherry. Meat, eggs, salt, and pepper. Flavor boosters — such as scallions, lemon or lime zest, ginger, etc. Blue Cheese and Bacon — Bison, celery, blue cheese, bacon. Double Mushroom and Sherry — Veal, pork, fresh mushrooms, dry sherry, dried mushrooms, thyme, sage, ketchup glaze. Turkey, Bacon, and Fennel — Turkey, fennel, white wine, scallions, fennel seeds, crushed rep pepper flakes, bacon. Indian-Spiced Lamb — Lamb, beef, carrot, red bell pepper, fresh ginger, jalapeño, cilantro, garam masala, honey glaze. Sausage, Lemon, and Parmesan — Beef, veal, sweet Italian sausage, white wine, lemon zest, Parmigiano – Reggiano, parsley, honey glaze. Southwestern Spicy Pork and Bell Pepper — Pork, bison, red bell pepper, jalapeño, lime zest, cilantro, cumin, mild chili powder, chipotle glaze. Stout and Cheddar — beef, veal, carrot, celery, stout beer, dried mushrooms, Cheddar, parsley, bacon. Greek Olive, Red wine, and Feta — Lamb, red wine, lemon zest, black olives, feta, oregano, honey glaze. Can you believe all the amazing variations? Polpettone Italian Stuffed Meatloaf is not going to be the end of our journey into this comfort food adventure. If you have some game meat, try out one of the recipes. Which one would you want to try first? Have you downloaded the free printable meat chart? It shows the cuts of meat and the best way to prepare them. Hurry and get it here. FOR THE RECIPE YOU MAY NEED . . . The following are affiliate links. We are a participant in the Amazon Serviced LLC Associated Program, an affiliate advertising program designed to provide a means for us to earn fees by linking to Amazon.com and affiliated sites. Meatloaf is certainly one of our family’s favorite comfort food. It brings back wonderful memories of our childhood and smelling the wonderful aroma that permeated the entire house. The key to a delicious meatloaf is striking the right balance between the meat, bread, liquid, and spices. For this recipe, we decided to use ground venison in combination with hot pork sausage. We added ingredients that we love then topped it all with bacon. If you like this recipe please consider giving it a five-star rating. 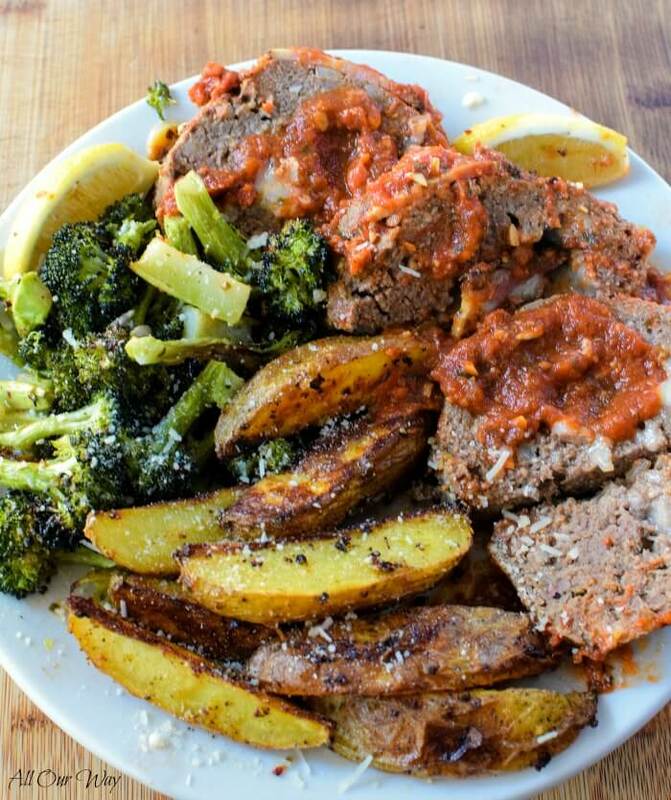 Italian Stuffed Meatloaf is one of our favorite comfort foods. The venison is spiced with aromatics, chipotles in adobo sauce, and herbs. The meatloaf is stuffed with mozzarella cheese and topped with bacon slices. A delicious dish that has many variations. 1) Heat the oil in a 10-inch skillet over medium-low heat. Cook the onion and garlic stirring frequently, until softened, about 4 minutes. Transfer to a large bowl and let cool. 2) Position a rack in the center of the oven and heat the oven to 375 F.
3) Sprinkle the Panko crumbs over the aromatics. 4) Add the venison, pork, and beaten eggs in the bowl. Scatter all of the ingredients except for the bacon and mozzarella cheese. 5) Put a little bit of olive oil on the palms of your hands. Gently mix all the ingredients until just combined -- try not to compact the mixture as you do this. 6) Tear a long sheet of wax paper and place in on the counter. Scoop the mixture onto the wrap and make a rectangle using your hands to pat it out. Sprinkle the mozzarella in the middle. Sprinkle a little bit more parmesan cheese on top of the mozzarella if desired. Use the wax paper to help you roll the meat away from you. Using the wax paper bring the other side toward you. Pat to form a log. 7) Make sure the ends of the loaf is sealed. You don't want the cheese to ooze out. 8) Transfer the meatloaf to an oil sprayed baking pan. 9) Lay the bacon strips diagonally on the meatloaf. 10) Bake until an instant-read thermometer inserted in the center of the meatloaf registers 160 F. for 40 to 55 minutes. When it is finished, broil the meatloaf about 6 inches from the broiler element until the bacon is brown and crisp. 11) Let rest for 10 minutes. With a large spatula, transfer to a cutting board or serving platter. Cut into 3/4 to 1-inch-thick slices. 12) Optional: Add homemade or your favorite marinara sauce on top. Note: Recipes and content from © 2014-2017 are copyright protected. Please do not use content or recipe without prior written permission. If you want to share the information please link to this post. Grazie! This stuffed meatloaf looks delicious Marisa. Perfect and flavorful meal , My hubby love meat loaf, I need to make it for him. This looks incredibly flavorful. I love the little zip from the adobo. That’s an unexpected but welcome touch to the seasoning! I love stuffed meatloaf. My mom often made them. 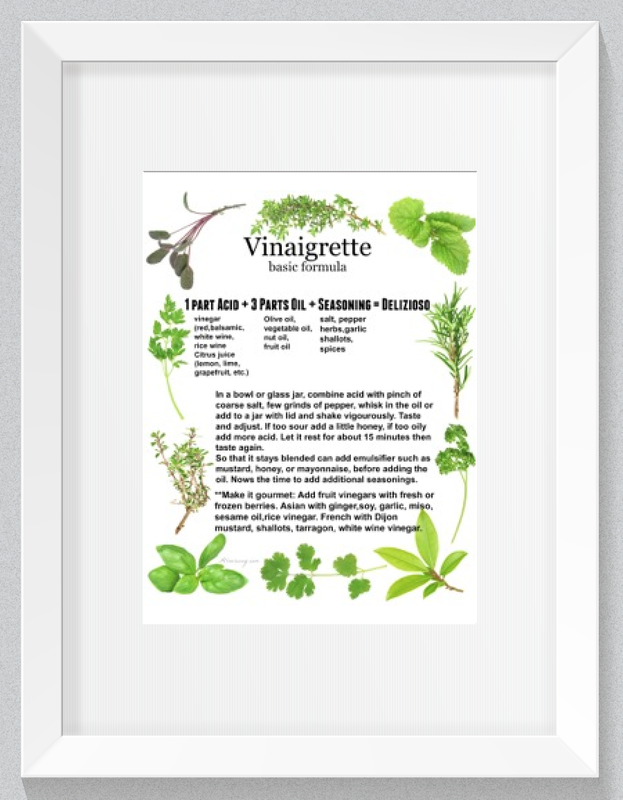 This would make a perfect side dish for a festive occasion. Absolutely comfort food and always welcome leftovers. Love meatloaf sandwiches. I can only say, absolutely delicious! 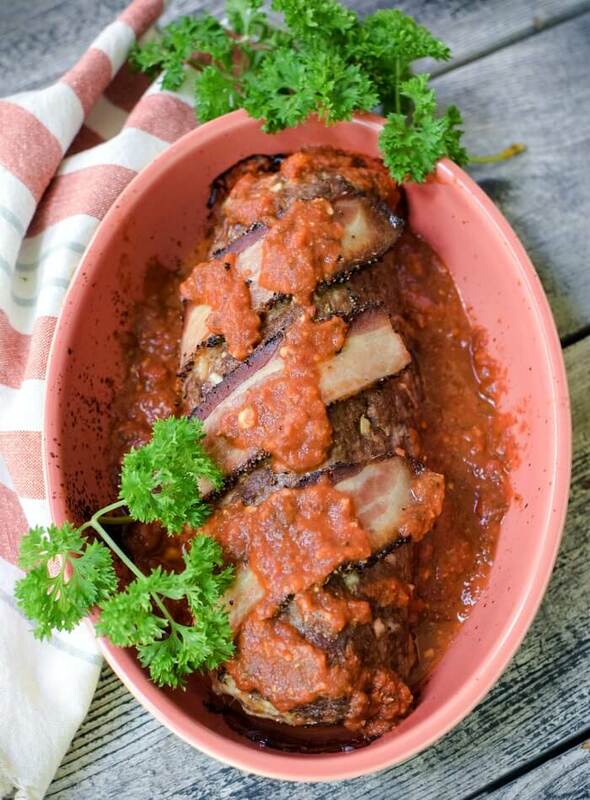 So much flavor packed into this amazing “meatloaf” which is really a thing of beauty. The bacon is just a delicious icing on the cake! A must make meal for everyone! It’s so interesting that each region of italy has their own version, I never knew that! I really need to learn not to look at your posts when I’m hungry. This looks like it needs to be in my belly, Marisa!! oh yummmy!! Italian style AND topped with bacon! This is comfort food at its best. I have a bunch of venison and love making meatloaf with it. So good!! My mom used to make meatloaf but with beef. I love stuffed meatloaf really does make it extra special. The best part is left over because mom would use them for school sandwiches. yum! Every time I read one of your posts I feel like I’m in a Italian cooking class! This looks delicious and I can’t wait to give it a try. I love how you explain about the liquid and aromatics, etc. Good info! Marisa, what a beautiful plate of food! We love a good meatloaf, and one that is like a giant meatball is definitely going on the must-make list! Great take on a meatloaf. Going to try this out with the family. When my family came to Long Island, our neighbor was Italian and she taught me so many recipes and this brings me back. I love that you added venison to a version. Absolutely delish! Wow, I never thought of all those variations. I have to branch out from my old standard. Hope you had a wonderful Christmas! Hello, Linda! I did have a wonderful Christmas and I hope you did as well. I certainly do like the versatility of venison but also the many meatloaf variations.Felice Anno Nuovo! What a great holiday main! The recipe doesn’t seem hard to make at all! Merry Christmas Marisa! Hello, Elena! The recipe is quite easy!! Hope you give it a try. Happy New Year! looks so flavorful, perfect for a get-together! Thank you, it is very tasty!! I’m always looking for new venison recipes to make for the holidays. I usually head home and I love to share new recipes with my father, like this one. I can’t wait to try this, yum! Hi, Jessica! This was really a very tasty dish! We do like venison and it’s only recently that we’ve enjoyed it — thanks to our son. Merry Christmas and Happy New Year. I love the idea of the Sausage, Lemon, and Parmesan combo – gonna have to give that a try! 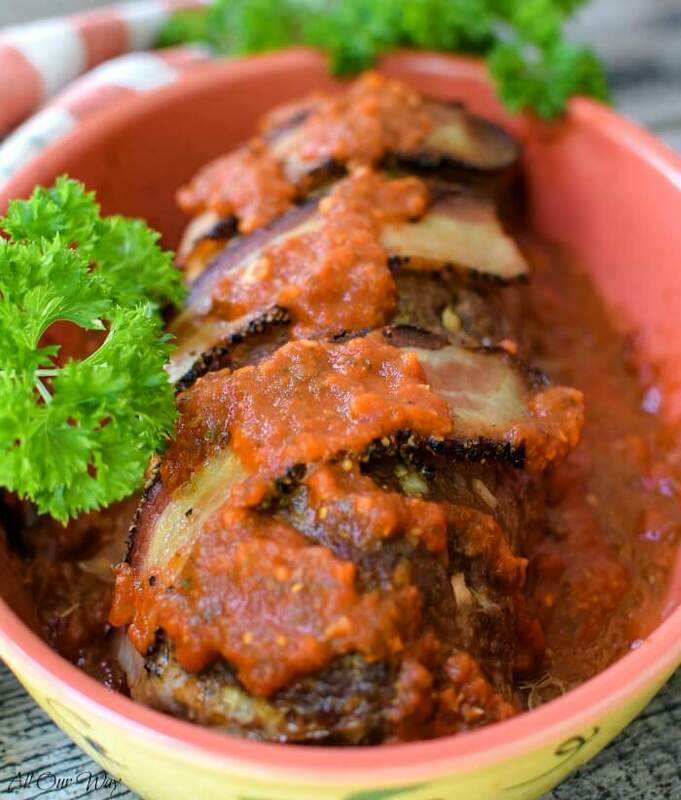 That meatloaf looks fantastic – I love the idea of it oozing with delicious cheese! This sounds delicious! My husband would love this dish. Perfect for our next date night! I had no idea that there was such a big difference between the regions, the way they make it and serve polpettone. Of course I had heard of this before but I have never had a chance to enjoy an Italian Christmas feast. My mum told me that her Italian grandmother would invite everyone when she was a child and prepare these wonderful dishes for the whole family. Oh, this looks so delicious! Pinned! Meatloaf is one of my favorite meals to eat. And I love the idea of a large meatball. Great way of breaking down what goes into making your perfect meatloaf! I think you’ve pretty much cracked it, this looks delicious. Il polpettone è sempre una buona idea !Felice natale Marisa, un abbraccio ! Grazie, Chiara! Felicie natale e Buon Anno Nuovo. Un abbraccio forte! Stuffed meatloaf is one of my favourite things. I love how you provided so many variation ideas. You’re welcome, Jolina! I hope you get a chance to try out some of the variations. Merry Christmas!! I had no idea this excited and it’s GENIUS! Would be such a hit at our house, can’t wait to make it! First, I’m sorry I missed your video this afternoon…..I enjoyed watching it while having coffee before dinner. I’ve been wanting to call you but know you’re busy with Christmas preparations….same at our end. 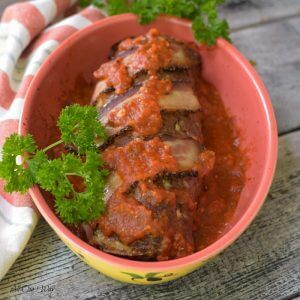 What a variation of meatloaf recipes…..I like the fact you can take this recipe to so many levels……ALWAYS, a great comfort food and meatloaf sandwiches are the best. Looks delicious and has me craving some fresh venison! Hi, April! Will you ever be popular with your boys!! Merry Christmas! Hi, Veena! If you like meat you’d like venison. Very low calorie! We really enjoyed that recipe. Give it a try with beef. Wishing you and your family a Merry Christmas! Don’t all Italians love meatballs, Annie? They are just nuggets of goodness. The meatloaf is just a huge nugget of goodness. Sending Merry wishes for the Holidays! Un abbraccio forte! You make me want to go to Italy again every time I read your posts. So interesting to learn about your culture! This sounds much like my brother in law’s meatballs and he makes the best! My family will love this. Can’t wait to make it! Oh my goodness…this looks soooo good. I’m gonna need to add it to my menu! This looks so delicious. Perfect comfort food…and I would like to give venison a try. I will have to ask my neighbour for some. What a fantastic meatloaf! It has wonderful ingredients and lots of flavor. Looks big enough to get lots of meals from the loaf, so very economical.